Join us to shake off the weekend and fill your Monday with positive vibes courtesy of a good workout and some goodies from Whole Foods. 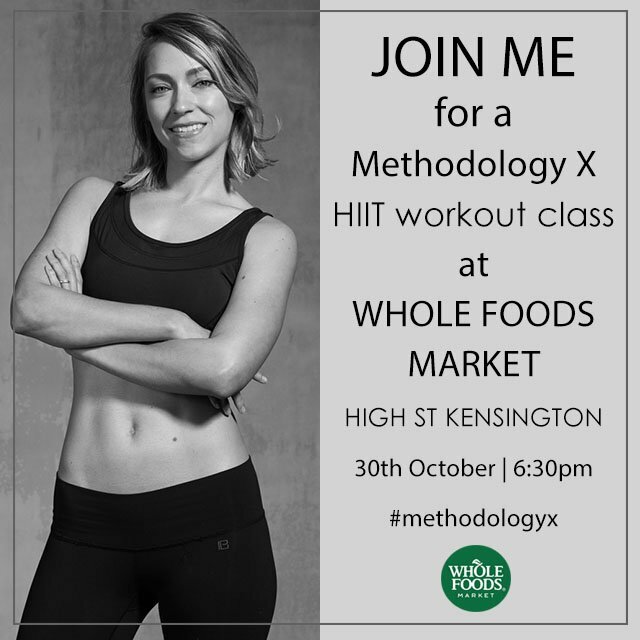 Methodology X helps to tone your entire body, improve core strength and shape your glutes. One of our in-house Methodology X Instructors, Giselle Grant, will lead you through a 50-minute class that finishes with a mini meditation. This class is suitable for all fitness levels. Mats will be provided; just come ready to train. After the class, FIT KIT will be offering free samples from their new beauty range. FIT KIT is a new range of shower-gels each powered by specially selected natural active ingredients. Their goal? To help active bodies bounce back easily after exercise. Tickets cost £10 (+ booking fee) and include a goody bag full of Whole Foods treats to take home. £5 of your ticket price will be redeemable against any Health & Beauty purchase on the night of the event. Refunds available up to 7 days prior to the event day. Can’t make it to our class at Whole Foods? You can buy the Methodology X workout here and do the workout where ever you are in the world!